The Diploma in Social Media for Business programme includes a good range of topics and provides the opportunity to gain the essential knowledge and skills needed to plan, implement and monitor effective digital marketing campaigns, to see how mobile marketing can be used for the business, examine how to use social media channels and tools appropriately and how to implement social and mobile into the marketing plan for the business. 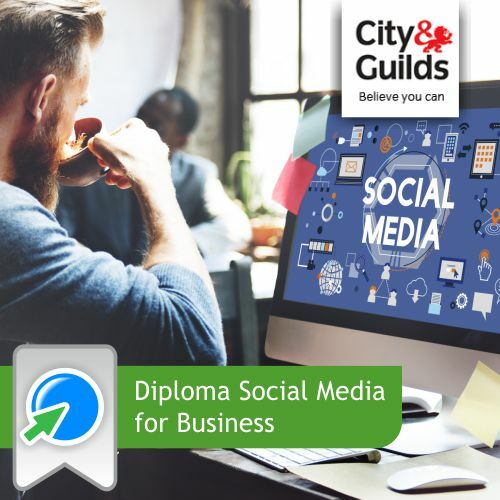 By the end of this - City and Guilds’ flagship professional social media qualification - you will have a professional level, practical and theoretical knowledge of the use of social media for business. You will cover all the major social networks including Twitter, Facebook, LinkedIn, Pinterest and Google+ and you will learn how the use of these can be linked to your website through a clear digital marketing strategy. You will learn about search engine, social media and mobile optimisation and how all of these can be used to benefit businesses. This qualification is delivered online through a series of regular, live, online group webinars. These not only provide the opportunity to seek guidance directly from your course tutor but also offer the opportunity for group discussion and interaction. Whilst it is recommended that you attend the live online seminars, we appreciate that this is not always possible so these are recorded for viewing offline at a later date. There are 12 webinars delivered over a 9 month period. Units are delivered through a combination of online classes and E-learning modules.